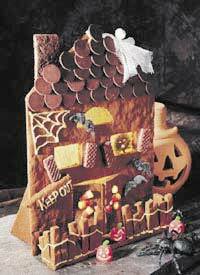 Create a creepy gingerbread house decorated with your favorite candies and cookies. It's a fun project for the entire family! Heat oven to 350 F. Grease square pan, 9x9x3 inches, and rectangle pan, 12x16x2 inches. Stir together brown sugar, shortening and molasses in large bowl; stir in water. Stir in remaining ingredients except frosting and candies. Press one-third of the dough into square pan; press remaining dough into rectangle pan. Bake 1 pan at a time about 15 minutes or until no indentation remains when touched in center. Cool 5 minutes; turn upside down onto large cutting board. Immediately cut as shown in diagram (cut windows if desired). Cool completely. Decorate front of house as desired using Decorating Frosting and assorted Halloween picks, Halloween rings, candies and/or cookies. For windows as shown in photo, cut yellow tissue paper slightly larger than outline of windows. Brush paper with vegetable oil and "glue" to back side of windows, using frosting. Use frosting to attach supports to back of house, sidewalk to front of house, door and sign to front of house and fence to sidewalk. Complete decorating as desired. Your haunted gingerbread house is made from natural ingredients so should be kept for one holiday only. It's so simple to create, you’ll want to make it bigger and better next year.